What kinds of construction are you involved with? CHC has over 30 years of experience working in all areas of construction but find we most enjoy the residential construction projects whether they are new construction, remodels or additions. The majority of our work has been in Eagle County, Colorado. CHC has managed projects as Owner’s Representatives in other Rocky Mountain locations. How do you think the built environment will change and be different in the next five to ten years? We feel that as the economy continues to gain strength and families are once again looking to invest in new homes, that homes will be more efficient in their use of space with family areas serving more than one use. Incorporating energy efficient and green materials and practices will continue to be of importance. What is the most poorly understood aspect of your business? One aspect that we feel is not understood in the building industry is the incredible value that a professional home builder or remodeler brings to a project. The idea that anyone can build a home often leads to unhappy homeowners. CHC strives to stay at the forefront of our industry, including continuing education in building trends, products, and techniques. A good house is one that may meet your basic housing needs, but may not work for you or your family’s lifestyle needs. A great house is one that has been customized for the way a family lives and incorporates the newest in energy efficiencies and green technologies. A great house inspires one to want to spend time at home, and enjoy life and quality time with family and friends. Timeless. Our work is completed using a series of carefully crafted steps which results in quality projects that stand the test of time. Our current projects are all remodels, and it is always exciting to take the old and outdated and transform it with a new streamlined design using fresh new materials and finishes. What do you enjoy most about building homes for your clients? We strive to listen to our clients and translate their ideas and thoughts into a home that, ultimately, they will enjoy with their family for many years to come. Do you have favorite materials or building principles you are known for? entire project life cycle. We treat our clients’ projects and money as if they are our own. This has resulted in incredible projects and very satisfied clients. If you weren’t building contractors, what would you be doing? Had construction not worked out for Kevin, he would be working with the Forest Service. Lori dreams of being a cowgirl again. The mountains of Colorado offer so many outdoor activities it is hard to choose between the skiing, snowshoeing, hiking, mountain biking and golfing. We enjoy the spring and fall. It’s always so exciting to see the seasons change and it leads to anticipation about what is next! 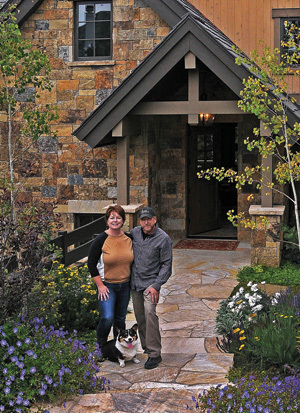 Kevin and Lori Mowder share a passion for the construction industry and put their complementary strengths to impressive use in building some of Vail Valley’s most wonderful homes. Custom House Construction celebrates 20 years of construction excellence, and is looking to a strong future.